• Much of the editorial process consists of understanding an audience, filtering and curating – all of which equally apply to librarianship. We can also add to this list the importance of discoverability (the ease with which your products and services can be found online). • Multimedia is so 90s. Today it’s all about cross-media, or spreadable media. • Waterstones, to name the UK’s largest chain of bookshops, takes its stock on a sale or return basis. This means that the onus is on the publisher to print just the right amount for each title. A lot of work goes into getting this right, to keep costs to a minimum. • Penguin Random House UK’s revenue is split 75% print / 25% digital. I should have asked if the profitability of each sector is roughly equal. • Dan had hotfooted it back (early) from SXSW, where people were talking about how digital is influencing print. • The media may be changing, but storytelling is as important as ever. Tech firms – e.g., WeTransfer – are investing in stories to promote their digital services. • The EPUB3 standard allows for fixed layout ebooks with interactive features. Re-flowable text was the USP of the original standard but some documents, such as picture books, require that the layout does not change according to screen or font size. I happen to be developing brochures in EPUB3 format for a multinational industrial client and I’ve had problems getting all of the features to work on all platforms. Apple is the best. Microsoft is the worst. Android is somewhere in-between. Who knew? • Penguin Random House UK has its own in-house app platform that editorial staff can fill with content in order to publish an app; so far, this is used for cookery apps. • Audio is also a large and growing sector of digital. Car manufacturers are developing digital dashboards and want custom content to sell with them, for which they turn to publishers. • Penguin Random House UK also has an ‘author portal’, where its authors can login and get live sales data and more on their titles. • Dan also shared many other examples of digital content – much of it far more than just an ebook version of a print book. For example, a cross-media edition of Graham Greene’s The Third Man, which combines scene’s from the film with the text of the story. Gimmicky, you might think, but Greene wrote the screenplay before the book. The bottom line is that, despite the proliferation of media – much of which is technically far more accessible to individuals who might want to publish something – content is still king, and publishers are still a trusted source of good content. Case in point? If you self-publish and have a hit you’ll get offers from trade publishers that will lead to your being signed, making money, and reaching a significantly wider audience. Dan seemed pretty relaxed about the future. Last time I mentioned that an upcoming session would be dedicated to Open Access (use title case and you signify the movement, or Movement), and session 6 was it. We had an excellent presentation from Martin Eve, who has written a book on the subject which, thanks to its being open access, you can read for free online. As he said in his presentation, the trouble with allowing people to read your book for free online is that people will assume it’s rubbish. But as you look into how scholarly publishing – both journal and monograph – is financed, and the consequences those conventions have, it becomes clear that it is a subject worth questioning, at the very least. The whole thing goes round in a big circle so it’s not always clear where to begin but let’s start with the academic researchers who write up and publish the results of their work. Such people tend to be employed by universities which, in Europe at least, are essentially state-funded. In fact, where the money comes from to make the research possible is not all that important because, under the conventional publishing model, anyone who wants to read that output has to pay to do so, whether they helped to fund it or not. In practice, university libraries spend large proportions of their budgets subscribing to packages of scholarly journals and purchasing print and ebook monographs from their corporate publishers for the use of their students and staff. One of the advantages of being a paid-up student is that you get online access to a wealth of scholarly material that is not available to other people. So, count one: work that would benefit everyone is not freely available to everyone, even to those who contributed to making it happen. Count two: accessing it enriches corporate publishers (the largest publishing groups make substantial profits). As having an article accepted by a scholarly journal also tends to entail giving up the copyright on said article, researchers sometimes find that they cannot even access or reuse their own work in its final published form without paying to do so. Let’s call that count three. It should also be stated that there is – to take UK higher education as an example – an overwhelming imperative to publish for any ‘research active’ university employee. Ratings and funding flow from having the greatest ‘impact’, which means research output that is read and cited in other works. Because of this, the body that allocates taxpayers’ money to such things HEFCE mandates that the results of its funding must be published open access. In practice this means a form of open access known as Green, by which the author is required to upload a pre-print (text before final formatting) to his/her institution’s repository (digital library). Yes, you’ve guessed it – the publishing process otherwise works in the conventional way. The alternative to this is Gold open access, in which the publisher forgoes charging for access by instead charging for publication. Again, something that – rightly or wrongly – comes with an air of suspicion, especially in scholarly publishing. If you have to pay to publish something, is its merit for publication overlooked? The debate continues, not least because for monographs, which constitute a greater proportion of scholarly output in the humanities, open access is less developed. There is also the fact that many scholars – not least because the funding system rewards it – want to publish in the most exclusive journals, which have little motive to adopt any form of open access. Assumptions and prejudices need to change for open access and its benefits to become conventional. Publishers certainly add value and those costs must be met. Fortunately, it looks like the movement towards making more information more available is, at least, on the right path. Session 5 of LAPIS concerned scholarly publishing – particularly the history/present/future of academic journals. 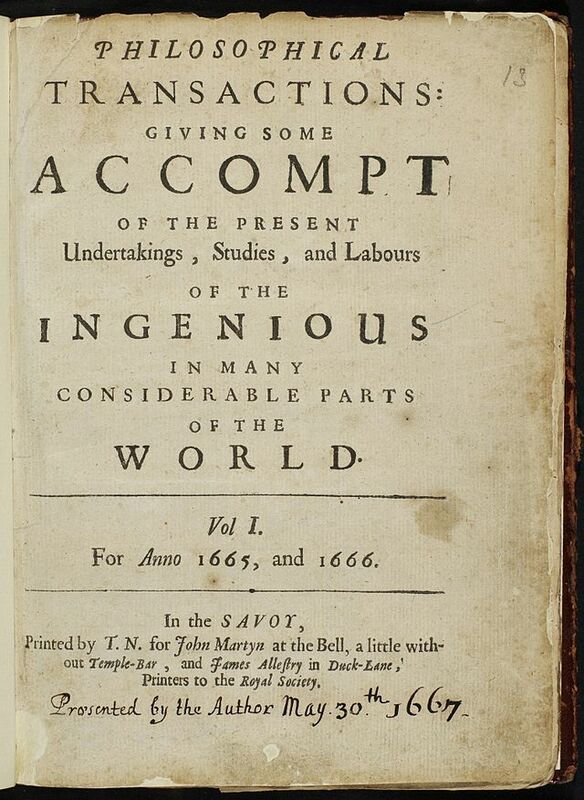 Starting with the Philosophical Transactions (of the Royal Society) in 1665, such journals are often the organs of learned societies, although they may be published in association with a commercial publisher. Their remit is to inform members of the society, and anyone interested in the field, of new research. Philosophical Transactions established the now common principles of scientific priority (an early example being the Newton/Leibniz – both Fellows of the RS – argument about calculus), and peer review. Peer review is essential to the credibility of such publications, particularly in an age such as ours, in which anyone can publish, one way or another. The greatest titles derive their cachet from their illustrious histories and exclusivity, and the assumption that any article that makes it on to their pages has undergone thorough scrutiny from experts in the field who have pronounced it eligible for publication. Open access gained a boost this year when the Higher Education Funding Council for England (Hefce) announced that all UK research post-April 2016 must be open access in order to qualify for funding assessments. How, or whether, this impacts upon an article’s status is yet to be established. Academic libraries spend huge sums (thanks to high course fees) on digital subscriptions to scholarly journals. Public libraries can only dream of having similar access, though the Access to Research [http://www.accesstoresearch.org.uk] collaboration goes some way to address this, but rather on the publishers’ terms, although this is a good reason to visit a public library as you can’t access it from home. Open access has been for some time now a hub of innovation in publishing technologies, promoting the emergence of academic publishing start-ups and researcher-led projects. How to take those to the mainstream, to be recognised by senior academics, administrators and funders, is in my opinion the biggest challenge. Taking a step back from the historical process that has led to the state of scholarly publishing today there is clearly a significant amount of work required to formally publish articles, which needs to be paid for. It is equally clear that allowing the widest possible access to scientific research is a public good. The scholarly journal, whilst somewhat old fashioned, is very much fit-for-purpose. But publishing, after all, is about providing access. The digital revolution going on around us should allow publishers to do that even better.